Visiting my Grandpa and he showed me how to make my own name stamps from an eraser. The first is my name in English, the second is my name in Japanese. This will work with any image, not just your name. Draw your name on a piece of paper. This is so you don't have to reverse the image in your head yet. You can free had this if you would like. Just remember you need the mirror image of your name. See mine in the picture. OR if you don't want to free hand, see next step. Re-trace/fill in your image with pencil. Flip it over and press it on your eraser. careful not to smudge, but put a good deal of rubbing into it. Peel off carefully and see if your image transferred. If it is spotty, trace over the image on the eraser with a pen. ***BE CAREFUL*** With a sharp craft knife, CAREFULLY cut out your image/name. You can either cut out the negative space around your name or cut out the letters. I did mine both ways. Brush off the crumbys. and wipe of as much excess pen and graphite as you can. Not all of it will come off. It won’t interfere with your stamping though. 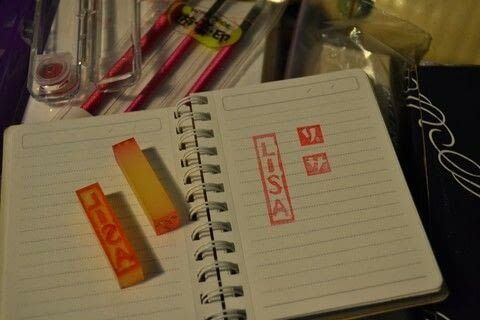 Now ink up and make your stamp on the world!! !